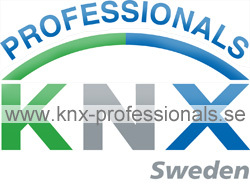 KNX Professionals is a group with KNX-pros in which all of them have completed KNX advanced course, which is a requirement from KNX. This means that they have been trained for heating and lighting control, use of couplers/routers in larger buildings, visualisation (displays), alarm, failsafe planning, extra software tools, m.m. KNX Professionals are real experts. They know a lot about the KNX- technology. Of course the skills are different between the members and the experience is blended (from installation, process automation to the HVAC-area). The goal of the group is that the members shall be updated with new KNX-technology, spread the knowledge and act for a sustainable development of KNX. In the group there are today about 60 members. More members ... and now we are 80 members in total. More members ... and now we are 60 members in total. More members ... and now we are 54 members in total. During the past month there have been 18 more members joining and now is the total amount 48 members.